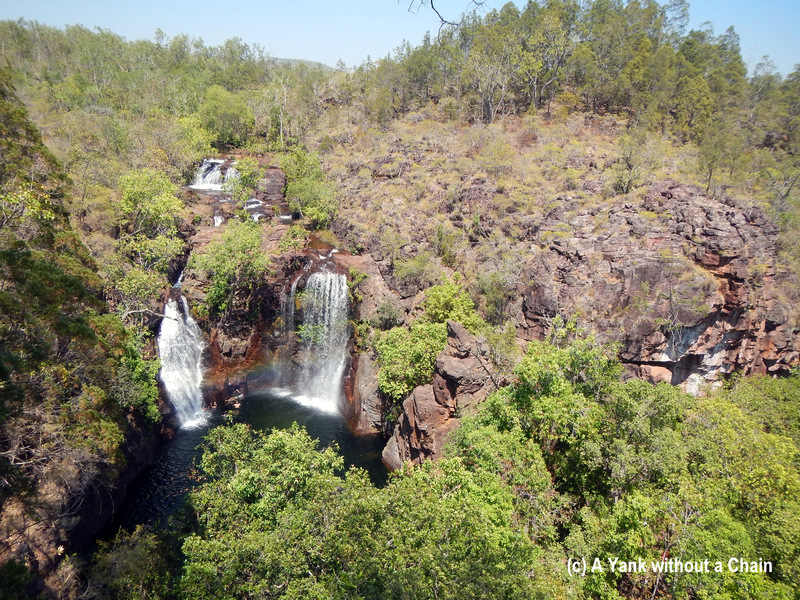 The final stop on my 10-day tour of the Top End a few weeks ago was Litchfield National Park, a popular weekend getaway for Darwin residents and home to loads of glorious waterfalls and swimming holes. Of course I took advantage of as many walking tracks as I could, one of which winds for about 5km along Florence Creek in relative peace and quiet. Another highlight of Litchfield is seeing the incredible magnetic terminte mounds. These termites use the magnetic forces of the earth to orient their cathedrals to optimize exposure to the sun. And, of course, the above ground portions of the nests are a gigantic 2+ meters high. At the end of this tour I settled in Darwin to begin a job for five months – I need to recoup a lot of the money I’ve spent in Australia! It certainly isn’t as cheap here as it was in Asia and South America, and I don’t even want to share how much I’ve been spending. So my blog may be quiet for the coming months, but I’ve got a big trip to WA planned in December and I’ll be sure get my camera ready. After our Mary River cruise we finally made it to Kakadu National Park, a sprawling 20,000 square km area (that’s half the size of Switzerland!) whose geological history extends millions of years and human history of over 40,000 years. Of course you can spend months exploring the park and not see everything, but the tour I was on just hit two highlights: the rock art of Ubirr and the swimming holes at Gunlom Falls. 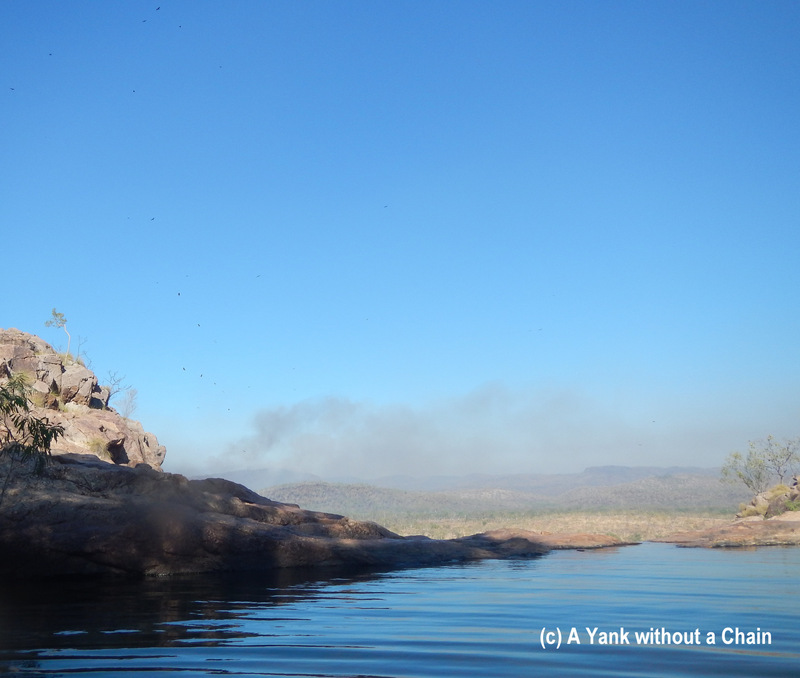 Both were extraordinary and I hope to make it back to Kakadu during my months working in Darwin. During the wet season the waterfalls are even more stunning and the wildlife is even more abundant. The third and final leg of my Top End tour focused on the national parks surrounding Darwin – mainly Kakadu and Litchfield. 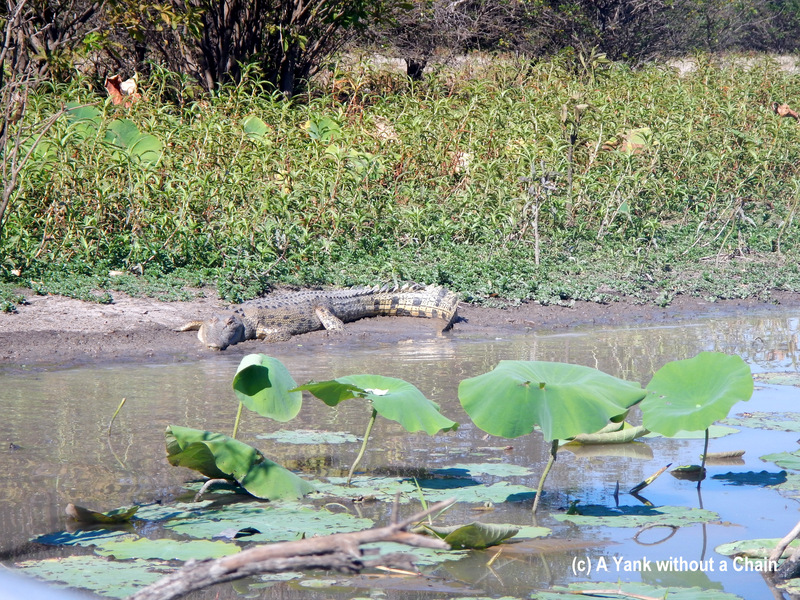 The area is renowned for its waterfalls, swimming holes, ancient rock art and… crocodiles! Mary River is is one of the most densely croc-inhabited places in the world, a statistic that you realize is not exaggerated once you’re out on the water. In just our 90 minute boat trip we saw about a dozen of the giant creatures. We also saw glorious birds (of course) and beautiful lotus flowers, which unfortunately are considered a pest in the area since they were brought in from Asia and are not endemic. The tour was really educational as we learned about the crocodiles’ mating habits and why they are built they way they are (hint: almost every detail helps them stay cool!). 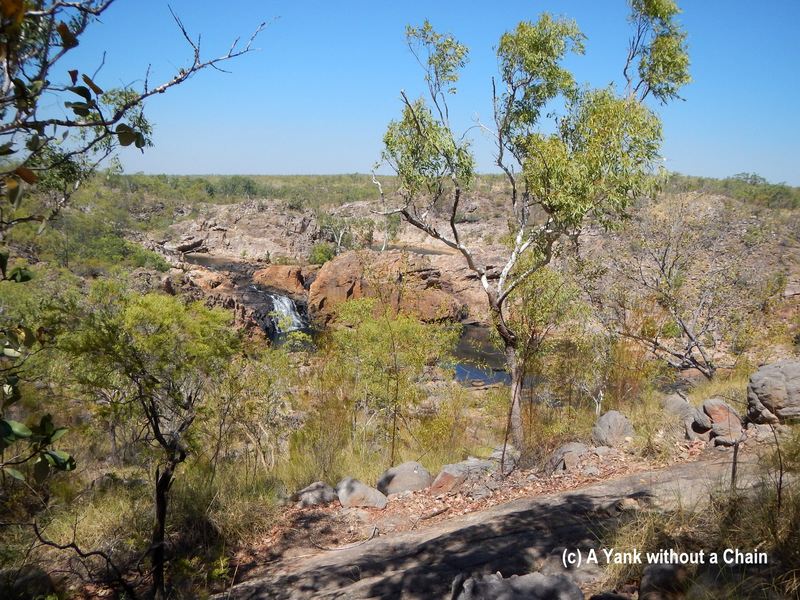 North of Katherine Gorge in Nitmiluk National Park is Edith Falls, a cascading set of waterfalls and plunge pools. There is a short walking path that goes up to a lookout over the upper pool, as well as several longer walking paths which I didn’t have the opportunity to do. As usual there were plenty of beautiful flowers and interesting critters around to ogle. This was the last stop on the leg of the tour up to Darwin and the scenery was getting greener and greener. Driving up from Alice Springs, the red rocks and sand suddenly turn into more familiar greenery and the air stops feeling so terribly dry. It’s just past this point where you will find the bustling town of Katherine (pop. 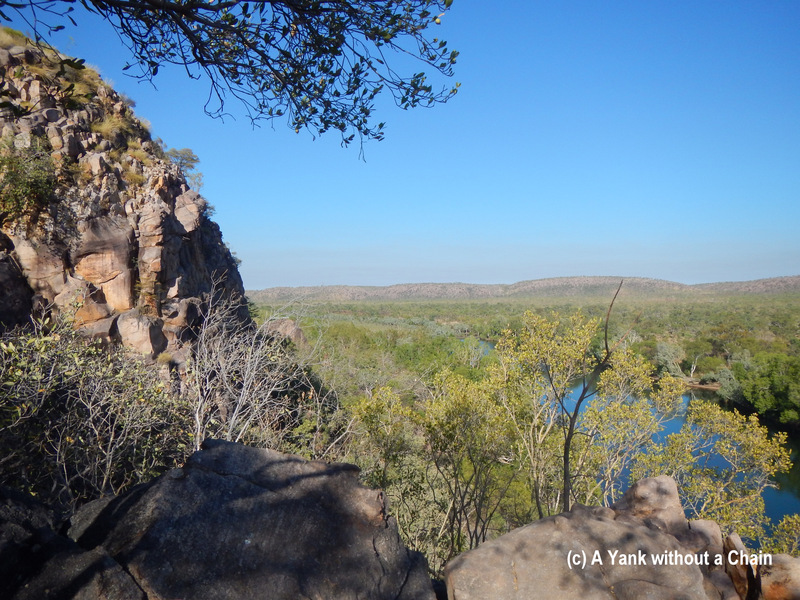 10,000) and the beautiful Katherine Gorge – known to aboriginals as Nitmiluk. Our group was able to do the 5k Baruwei loop walk which passes through a magnificent lookout over the gorge. As usual there is loads of interesting plant and wildlife, including wild cockatoos and tons of flying foxes. Making a new friend at a roadhouse off the Stuart Highway in the middle of nowhere! The drive from Alice Springs to Darwin is long – about 20 hours – and there’s not too much to see in between except for Devils Marbles and Katherine Gorge. So the guide on our trip had to be a bit creative in stops to make the 3 day tour more exciting, and she did a good job of it. 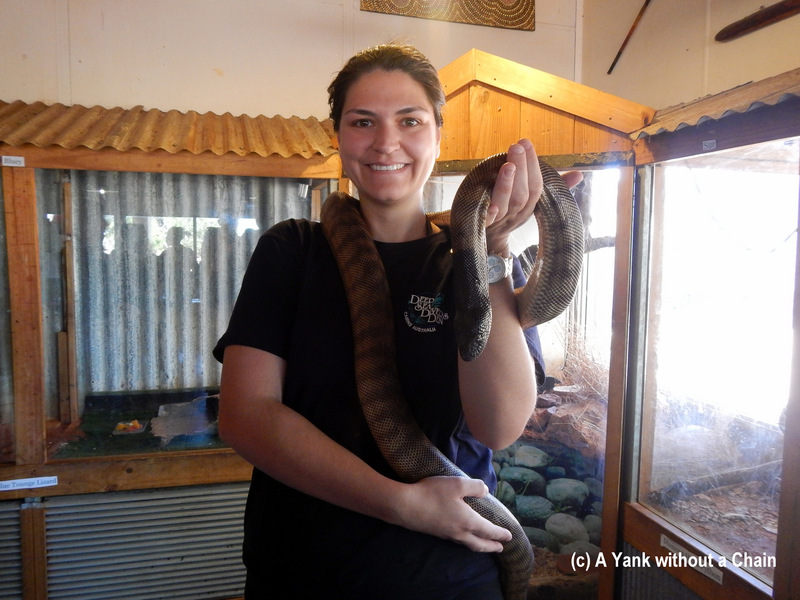 A friend of hers at a roadhouse south of Daly Waters has a few pet pythons which she lets visitors hold and take a picture with. Considering most zoos will charge $20 for this, I took the opportunity to do it for free. There is also the famous Daly Waters pub – a place which claims to have the oldest liquor license in Australia. Like lots of other outback roadhouses they have collected postcards, photos, letters, and other memorabilia from all over the world. Finally there’s the Mataranka thermal pools and Waterhouse River – a nice swimming spot just south of Katherine that’s not worth going out of your way for but a pleasant spot if you’re passing through anyway. 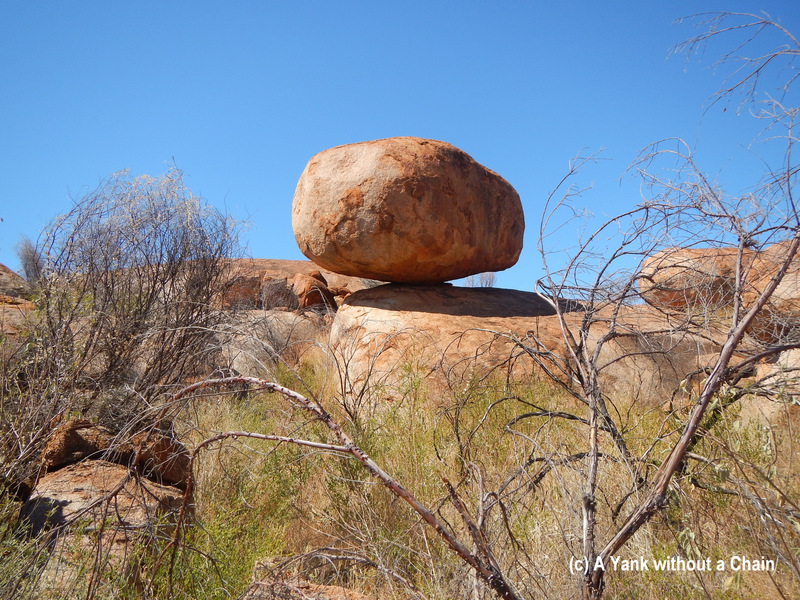 Heading north from Alice Springs on the grand Top End tour, the first big site is Devils Marbles (known to aboriginals as Karlu Karlu). The marbles are so ominously named because there is a toxic plant that grows nearby, and when the European farmers came through their sheep all dropped dead. The site, like most in the area, are sacred to the local people and conservation is paramount. However, unlike Uluru and Kata Tjuta, visitor access is largely unrestricted and no tickets are required. The boulders are quite strange, as a lot of them are completely hollow and can be split very easily. Still others are precariously balanced on larger rocks. One guy in my tour group remarked that they looked like they’d been dropped down by a particularly heinous tornado or hurricane, but actually they were carved out through wind and water erosion from a layer of granite under the earth’s surface over hundreds of millions of years.